If you use Firefox as default web browser on your computer, then here is a handy trick for quicker pasting of copied (clipboard) text. Once you activate “middlemouse.paste” option in Firefox, you can quickly paste copied text by pressing middle click button on your mouse within Firefox browser. This for sure will save few key actions and multiple clicks while you paste text in Firefox browser. 1. Launch Firefox browser on your computer, type about:config and press Enter key. 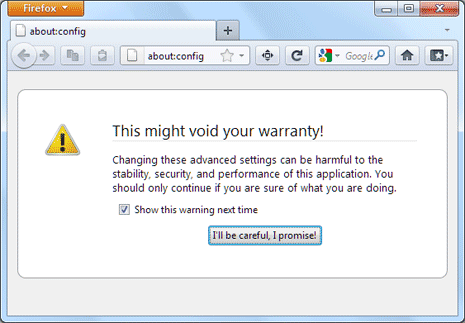 You will see warning screen for warranty, click promise button to continue. 2. On next screen, paste middlemouse.paste next to Filter box and press the Enter key. You should see “middlemouse.paste” listing with value set to False. Double click on that listing to make value true. This will enable middle click option in Firefox. Now copy any URL or text, and point to Firefox address bar. Press middle click button on mouse and your copied text or url should appear (paste) in the address bar. This allows quicker paste action, provided you enable above option and have a mouse with middle button (or scroll wheel). You can use about:config for number of Firefox customizations like reducing suggestions in Firefox address bar and many more.